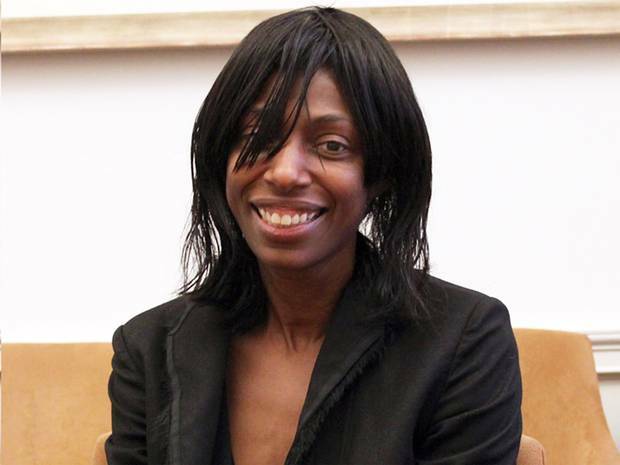 New Ofcom boss Sharon White. Second permanent secretary at the Treasury Sharon White will earn less than Ofcom CEO Ed Richardson when she replaces him in March 2015. Richardson took home £393,204 in 2013/14 for doing the job, according to the Ofcom annual report (p64) for the period. His pay was made up from salary (£284,362), pension (£56,872), flexible benefits (£19,956), benefits in kind (£2,014), and performance bonus (£30,000). The previous year he took home £378,158. White, a black woman, will earn a salary of £275,000, Ofcom said. A career civil servant, White was appointed to her present job in October 2013. Tom Scholar, the man she replaced, earned a salary between £150,000 and £155,000 a year, according to an October 2013 Gov.net report. A Cambridge economics graduate, White joined the civil service in 1989, starting with spells in Washington, the No 10 Policy Unit, and the World Bank. she later worked in the Department for International Development, the Department of Work and Pensions, the Ministry of Justice and the Treasury. She is married to Robert Chote, chairman of the Office for Budget Responsibility since 2010. They have two children. White was appointed by the Ofcom Board, vetted by an independent assessor, and approved by the secretary of state for culture, media and sport, Sajid Javid. How the comms world is evolving, by DCMS. There is less than a month left to respond to the government’s Digital Communications Infrastructure Strategy consultation. The government seeks guidance on what people think will they require from a communications ecosystem that is fit for their purposes. In preparing the consultation document it consulted “companies, organisations and individuals from across the communications industry, consumer representatives, the regulator, other government departments and the devolved administrations”. Last year the Confederation of British Industries (not credited) said in a study of the UK’s broadband infrastructure that it was “a mistake to hold back the investment until after the next election” and that “households and firms in rural internet ‘not-spots’ need to be connected faster”. The Federation of Small Businesses (credited) said earlier this year the networks are not “fit for purpose”. “Many urban or semi-urban businesses can experience poor coverage too, and even where broadband is available the range and quality of services often fall short of what businesses require. To be fair, HMRC recently acceded to FPB’s call to delay the compulsory online submission of VAT and tax returns until there is adequate access to high speed broadband across the country. But that is a small victory. Virgo makes the point that the government’s ambition for government services to be “digital by default” is at odds with the delivery mechanism. For him there are two questions: are the on-line services of government usable by the target audience, and how is that usability measured? As policy issues, those are a lot more useful than most of the 44 questions posed by the DCIS consultation (see Annex C for the summary.) Should government policy really consider technical issues like IPv6? Should it really care how UK network speeds compare to other countries? A disciple of economist Michael Beesley, Virgo strongly believes that regulators can, or rather should, do little more than control price, quality of service and predatory behaviour. “The recent histories of Ofcom and Ofgem indicate why he was right,” he says. The Rwandan telecoms regulator RURA has taken this to heart. Last year it set out easily understood and measured Quality of Service standards for mobile and fixed line operators. How the operators do it is up to them. Either they hit it or they don’t. At risk is their licence. That concentrates the mind. But to return to the consultation. TechQT has put up the entire document plus annexes in an easily commentable online format, thanks to DigressIT. It will collect comments and forward them to DCMS by deadline. And it won’t “disappear” them the way inputs to the Digital Britain report have mysteriously vanished. Comments close on 1 October. Have your say. It may be your last chance for 10 years. For all the thousands of words that accompany Ofcom’s consultations, the fact remains that the process of setting the basic price of communications is not transparent. Ofcom is obliged to not disclose the costing information that it gets from BT, which can be different from that which BT discloses in its regulatory financial statements. The Value Office Agency, which sets business rates taxes, does not disclose its financial model, or disaggregate BT’s products, so an important component of BT’s regulated prices is opaque. This leave plenty to argue about. Sky and TalkTalk in particular are fighting a running battle with Ofcom over its assessment of the effect of business rates on BT’s prices for unbundled local loop lines (LLU). The debate forms part of Ofcom’s consultation on the fixed access market, which goes into excruciating detail, complete with triple negatives, on the business rates issue in Annexure 26. The result of the debate is material to the two ISPs, which are the biggest exploiters of local loop unbundling. According to the Office of Telecommunications Adjudicator, by the end of May there were 9.3 million unbundled lines, and 5.68 million lines on Wholesale Line Rental (WLR). The ISPs contend that BT receives a rebate on business rates due to LLU that amounts to an estimated cash value of £23/y per line. The rebate covers BT’s loss of profits due to the alienation of the full earning potential of the lines. The VOA and Ofcom consider those putative profits to arise mainly from “downstream” products from Openreach. BT still makes money from renting out the lines, and besides any “lost profit” is at best a guess. Further, the business rates tax is a tax on assets, not profits. The ISPs believe whole of the rebate should be applied to the price BT charges for the line. Instead only 15p is. They say this leaves BT with net income from the rebate of more than £20/y/ULL. Put another way, this means the ISPs are paying around £180m/y in unjustified costs, which BT can then apply to subsidise downstream products. They allege that Ofcom ignores this income from the rebate in assessing Openreach’s assets to price LLU. They allege that the resultant prices for LLU are higher than they should be, and that BT’s downstream products benefit from an illegal subsidy. They argue that since BT’s rebate is based on profits, not assets; if Ofcom disagrees, it should get the VOA to change the basis of its rating of BT, and not simply pass the extra costs on to the LLU operators. Another issue that confuses matters is that Ofcom uses a theoretical all-copper network model for its sums. This disregards the thousands of kilometres of fibre BT has installed in the past five years. Fibre is cheaper to run than copper. TalkTalk’s plea for Ofcom to simply consider the outcomes produced in the market fell on deaf ears. Ofcom has dismissed the ISPs’ objections, but it did go back to BT for more data about its costs. “We have also carried out a PWNRC (profit weighted net replacement cost) calculation using data on BT’s assets which are more detailed than those published in the RFS…In the light of this, we do not now consider that BT’s 2011/12 allocation of cumulo [business rates] costs to MPF and WLR services is reasonable. “An allocation which is in line… would result in a reduction in the cumulo costs attributed to WLR rentals from £3.31 to between £2.80 and £2.98 in 2012/13 and a reduction in the cumulo costs attributed to MPF rentals from £3.16 to between £2.68 and £2.85 in 2012/13. We have reflected this reduced allocation in our charge controls,” Ofcom said in the annex. Ofcom has now published the new LLU charge control decision. It comes into effect on 1 July. Sky and TalkTalk did not respond to requests for comment. Vodafone has called on European regulators to ensure that non-incumbent-owned mobile network operators have access to fibre backhaul on the same terms and conditions as their in-house operators or face a declining competitive ecosystem. The call stems from a looming shortfall in microwave capacity and prohibitive pricing of incumbents’ fibre, poles and ducts to cope with the fast-rising volume of data traffic. Research by Analysys Mason commissioned by Vodafone found that incumbent operators favour their in-house mobile operators when it comes to accessto a fibre-based backhaul. “These inputs are not always made available to competing operators as a wholesale or retail product with the desired interface, quality, speed or price. “The fact that the required inputs are not available, or are extremely expensive, may dampen competition in the mobile market in some countries because the fixed incumbent operator is usually (with the exception of the UK) also a major mobile operator and can gain benefits as a result of this vertical integration – specifically the much greater capillarity of its fibre network,” it said. The leased line market, in which the mobile operators are a large segment, contributed £2bn/y to BT’s £18bn turnover, the researcher found. Ben Wreschner, who leads Vodafone’s regulatory economics section, said all Vodafone wants is access on equal terms and conditions as the in-house mobile operator. He said Vodafone accepted that there couldn’t be a single price across Europe, if only because labour prices differ. Instead he called for a harmonised approach to access to fibre for mobile backhaul. He called on the European Commission to provide guidance to BEREC, the European telecoms arch-regulator, for directives that national regulatory agencies (NRAs) can implement to give effect to this. The study showed that independent mobile operators use microwave extensively to backhaul their traffic. But they are running out of spectrum. 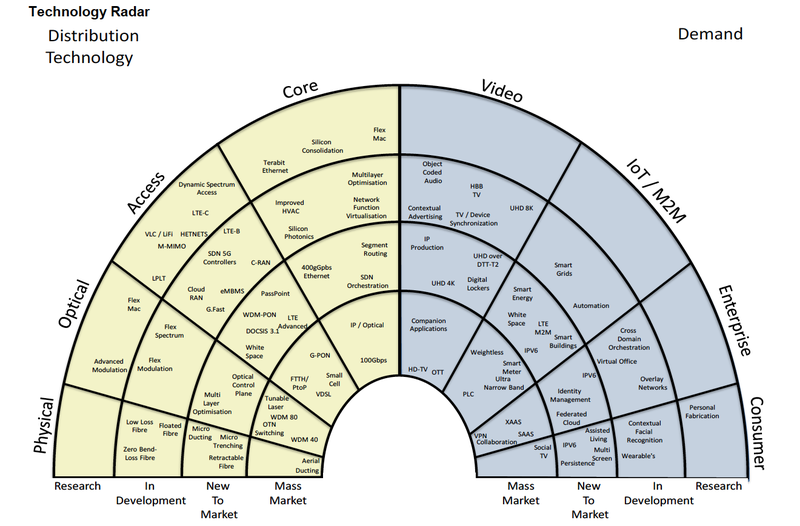 The shift to small cells for LTE traffic is quickly eating up the available capacity. Vodafone’s preliminary report for 2014 revealed that 4G smartphone users use about twice as much data as 3G users, mainly to stream video. Smartphone penetration in Vodafone’s European markets is around 45%. Both factors are pushing mobile operators toward fibre, which has the required capacity to ensure an acceptable user experience. The MNOs’ options are to switch to so-called E-band microwave in the 60-90MHz band, which due to rapid attenuation of signals, will require many more sites to be rented; to rent access to commercial fibre where available; to rent regulated fibre from the incumbent operators, or to build their own fibre networks. Vodafone has bought some of its own fibre backhaul (eg Cable& Wireless), but it has cost billions and doesn’t always cover the cities where demand is greatest. Building new fibre would duplicate existing fibre networks, take a long time, and cost a lot more on top of their expensive mobile licences. Last week Ofcom said it would give BT a further period of non-regulation of fibre prices for high speed (above 1Gbps), where it holds an effective monopoly outside London. It also promised to rule soon on a TalkTalk complaint that BT operates an illegal margin squeeze on fibre prices. Wreschner said he was watching the margin squeeze decision with interest, but stressed that that is a different market (retail) to Vodafone’s concern (wholesale) about backhaul. “We think the wholesale market needs specific regulation,” he said. This is why, although they face similar problems as altnets trying to provide fibre to rural homes and businesses, the mobile industry did not speak out when the BDUK process was being set up, he said. Parliamentarians will meet tomorrow to discuss broadband policy amid growing anger and concern among businesses that almost £2bn in taxpayers’ subsidy will leave the UK in a worsening competitive position. Digital Policy Alliance chairman Lord Erroll will chair the meeting (see below for details) that will hear from two recent papers that show that large parts of the UK will end up with broadband access one-fortieth of that of South Korea, and far behind France, Brazil and China by 2017, the deadline for the government’s current broadband spending plans. The report from Digital Business First (DBF) flatly contradicts Ofcom’s recent finding that the UK leads Europe in high speed broadband. In an open letter to Ofcom CEO Ed Richardson, the DBF said, “When ranked against all 27 EU states (not just the five Ofcom conveniently chose for the sake of a headline) the UK ranks tenth, behind countries like Portugal, Denmark, Belgium, Lithuania and Latvia. The forum’s assertions are supported by a study of the effect of line lengths on broadband speeds by researchers at Edinburgh University. The researchers found that one in eight Scottish homes is unlikely to be able to get more than 24Mbps, and 40% of rural homes and businesses will struggle to get more than 2Mbps. The average line length of Openreach’s network is around 3.4km. The average length from street cabinet to a premises is around 420m. This is enough for 40Mbps download speed provided BT implements vectoring on its VDSL lines. Not every line in every cabinet is being so enabled in its next generation roll-out, and at least 10% of cabinets are unlikely to be enabled. Openreach, BT’s network infrastructure division, redacts its line length information in recent public documents. However, in a 2011 report on line lengths and line costs to Ofcom, Analysys Mason said that BT had confirmed (in 2004) that its average line length (between the exchange and the premises) was 3.47km (including the dropwire length). 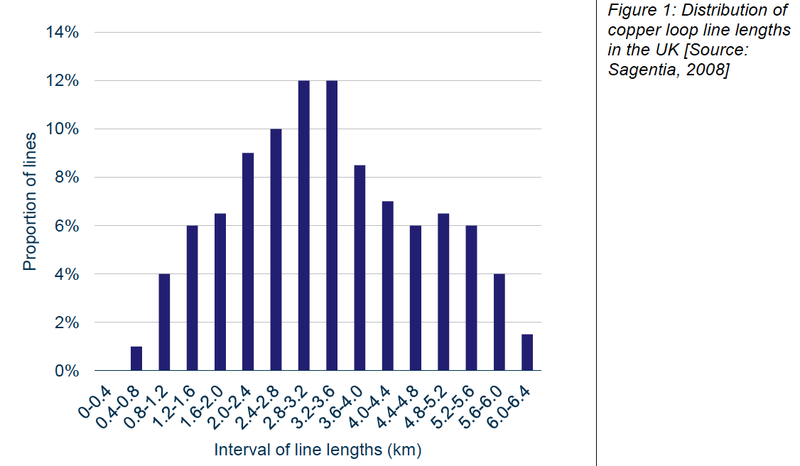 “This provides a reasonably good reconciliation with the (2008) Sagentia analysis (3.34km average line length). The same presentation also confirmed the distribution of lengths between the cabinet and the customer, with a typical 420m length and a small proportion of lines (10%) with a very long length,” it said. Analysys Mason later calculated the average Openreach line length at 1.704km – a figure hotly disputed by Openreach. 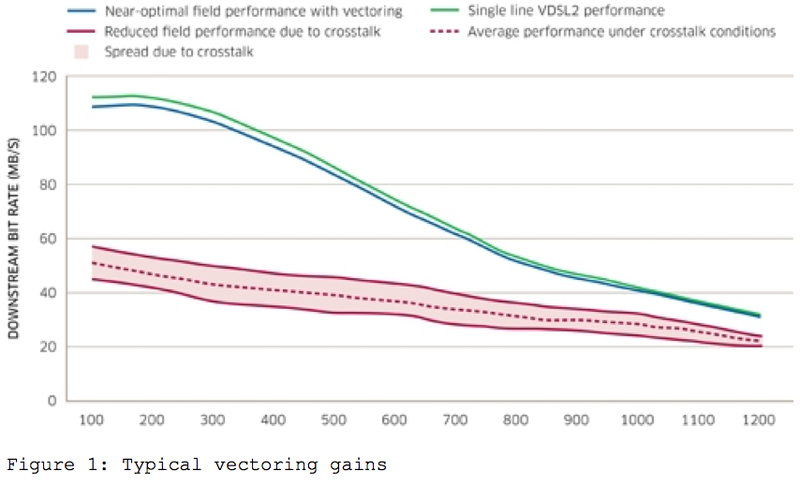 A 2011 White Paper by Alcatel-Lucent on the use of vector technology with VDSL2, the technology chosen by BT for its next generation broadband roll-out, found that at 420m, the average download speed would be about 40Mbps, while at 1.2km, it would drop to about 24Mbps (see graph). 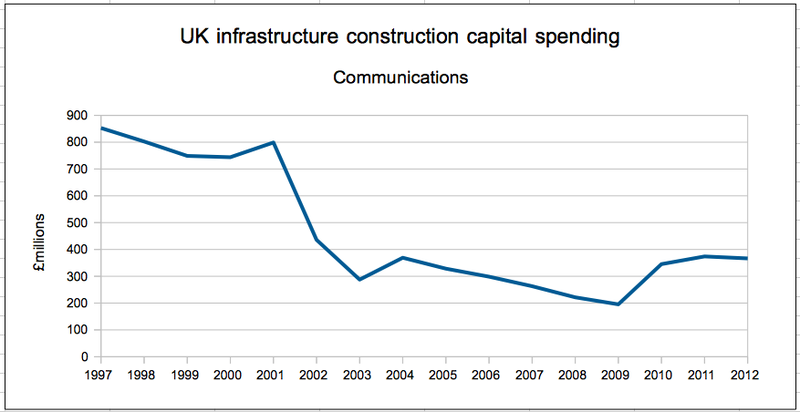 Figures from the Office of National Statistics show a declining trend in the construction of communications infrastructure (see graph). The ONS figures include post office buildings and sorting offices, but also exchanges and cables. This suggests that few new cables have been laid in the past 15 years, so Sagentia’s figures are likely to be reasonably accurate. As noted earlier, Openreach’s capex has been steady at around £1bn for several years. But it is starting to decline as it comes to the end of its “commercial” broadband roll-out to cover two-thirds of the population, but only one-third of physical UK. 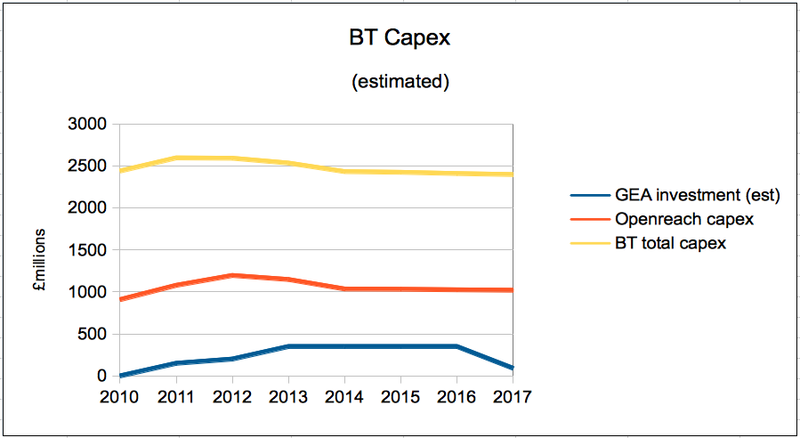 BT’s capex spend shows a gentle but steady decline. But as its own figures show, this is true only where line lengths are short, and it does not appear to include any offset for reclaiming the copper and reusing the ducts. The DBF is highly critical of what it sees as the government’s casual approach to broadband. “Current government policy and funding has failed to bridge the superfast broadband infrastructure deficit for 35% of the UK,” it says. It attributes this to a lack of consultation with user communities; adopting the “least ambitious targets and technological means” to deliver them, and to a lack genuine incentives for investment in future-proof high speed broadband networks. The DBF report also criticises the lack of ambition in making high speed broadband a universal service. Again quoting the NAO report it said, “The effect of designing a programme which only reaches 90% of the target area will make it more expensive at a later stage to cover the final 10%. It will also make it less commercially viable for anyone other than BT to bid, as no-one else will have existing infrastructure to bolt it on to. “Matters are made worse by the fact that BT is preventing local authorities from publishing plans showing which areas will not be covered, which would enable other, often community-based consumers, from filling the gap and ensuring 100% coverage. The DBF calls for a national broadband plan and responsibility for its delivery to be moved the department responsible for business and enterprise. “Any incoming government in 2015 should be specifying a target of at least 100Mbps for the UK ‘have nots’ within two years,” it says. It called for the UK to re-establish its world lead in mobile communications by “adopting an ambitious ‘can do’ approach to 5G technology”. 5G networks offer the prospect of universal ultrafast (1Gbps) broadband across the UK, it said. It also called for changes to the terms of the 4G mobile licences to ensure that the coverage obligations include a signal strong enough to deliver 10Mbps inside a home for 98% of the UK population, a voice service, and for more than one 4G mobile network to have the above coverage obligation. The meeting takes place on 24 March at 15.10-17.00 in Committee Room 4A, House of Lords, Westminster. * Presentation of Digital Business First’s report “The UK’s enduring broadband deficit: A divided nation – Time for an effective plan” by Alex Pratt, chairman Buckinghamshire Business First and Buckinghamshire Local Enterprise Partnership (LEP). * Comments by Stephen McGibbon, EMEA regional technical officer, Microsoft; Peter Olson, president of Digitaleurope and head of European Affairs, Ericsson; Alexandra Birtles, head of external communications, TalkTalk Group; and parliamentary contributions with closing remarks by James Elles, MEP and EIF co-founder. BT to broadband councils: Ask yourself – do I feel lucky? So, what did we learn from Round 2 of the Public Accounts Committee (PAC) v BT/BDUK (rural broadband division)? Hopefully not as much as we shall learn in the promised Round 3, but it had better come soon before we all lose interest and find better things to do with our lives, like learning macramé. What did emerge were clearer reasons for BT’s secrecy. Former Ofcom official Sean Williams, who spoke for BT, said that the equipment BT is installing in the BDUK intervention areas is exactly the same as that which it is installing in its commercial roll-out. Therefore revealing the price it pays for equipment in the BDUK areas would help its competitors in the rest of the country. This is disingenuous, perhaps delusional. No-one wants to duplicate BT’s copper network, so the price of a DSLAM and its path is irrelevant to competitors. The few firms that do want to provide connectivity in rural areas want to run fibre to the home or to a distribution point (call it a digital village pump if you will), and from there use high speed wireless to the home. They would find it helpful if they could use BT’s ducts and poles and cabinets to do some of it, but as they would be able to offer faster speeds than BT’s copper, BT wants to keep them off its passive infrastructure at all costs. Most would also like BT to backhaul their local traffic, but few can afford to pay the charges BT is asking to build (or light) the connecting fibres. Someone should be checking these costs, because Ofcom has allowed BT to set its own prices for wholesale fibre access. In consequence Ofcom is now having to investigate a TalkTalk complaint that BT has run a margin squeeze on the product. More to the point, in many cases BT fibre already goes to rural villages and towns, but only to schools and other public sector enterprises like hospitals and clinics. It would have been extraordinarily short-sighted of BT to run only a single fibre pair to each of these places, so there are likely to be spare unlit fibres in the neighbourhood. These could be put into service in short order at marginal cost. If someone was paying attention. Even if BT was that myopic, there is likely to be spare capacity on the fibre pair due to different peak times for business and recreational traffic. Even if this got congested, well, BT now knows how to make ordinary fibre carry 1.4Tbps over distances of more than 400km. That should be enough for most rural communities, at least in the short term. The other thing we discovered is BT’s employment of Catch-22 with respect to post codes. Williams said BT’s policy is that local councils are free to publish maps that contain BT’s proposed speed and coverage data down to seven-digit post code level. This is precise enough to say what upload and download speeds each and every premises in the country will be able to get. Two, Northamptonshire and Dorset have apparently done so. But it’s up to councils to decide. Most other councils have published speed and coverage maps down to five-digit post code granularity. This is because, Williams said, the finer details revealed in the seven-digit post cost templates are secret and covered by the non-disclosure covenants in the contracts councils have signed with BT. Publishing them would break the contract and theoretically open them to legal action from BT. Unfortunately none of the MPs on the PAC sought an assurance from Williams that BT will not exercise its rights if councils publish the speed and coverage details at the seven-digit resolution. Hopefully they will do so in Round 3. One bit of good news that almost got lost in the noise is that BDUK’s analysis of early roll-out invoices suggest that BT has over-estimated by about one-third the associated management overhead costs. It’s early days yet, and as the BT installation teams gain experience, those savings should grow. One hopes that they will not be used to finance the new £50m expansion of BT’s city fibre networks. See the Round 2 video here starting at 16.53.20. Telephone poles lashed together because Openreach can’t afford to swop cables from the old pole to the new one. This is a guest post from Walter Willcox and David Cooper, who have been involved with Surrey village Ewhurst’s efforts to get high speed broadband. Regular readers will know that it’s not easy, as this post, based on their experience, shows. Many local authorities that congratulated themselves for securing deals with BT are now employing their staff to promote the benefits of high speed broadband using BT’s marketing-speak, which can be grossly misleading and sometimes even false. Surrey County Council, indeed all county councils, should pay more attention to the technical details. Take the claim that BT is installing “fibre broadband”. In Ewhurst and almost every other village in the country, the final link between the cabinet and the premises is copper or sometimes aluminum. It is remarkable that no-one has asked the Advertising Standards Authority to investigate BT’s “fibre broadband” claims for possible misrepresentation. But there is a more important practical issue: millions of subscribers are likely never to get the service promised by BT and paid for by taxpayers under the BDUK contracts. The often-stated figures for those “Having Access” are based on the total number of telephone lines in the fibred-up street cabinet, yet very few of the new cabinets approach that capacity. Surely the ASA should require the cabinet capacity to be clearly stated? BT deploys new upgraded full-featured fibre to the cabinet (FTTC) cabinets with a capacity of 192 or 288 lines, but BT’s investment in the cable infrastructure is limited to single ducts and a single set of tie cables that each provide a capacity of just 100 lines. BT is on record saying that it will install more cabinets if the demand is there. Inevitably this means delay, sometimes of over 80 days, while remedial work is done to the cables, followed by even more delay to install a second cabinet. Most of the BDUK contracts to date are supposed to complete by the end of 2014 or 2015, so what happens if a cabinet’s full capacity is needed after the contract ends? Similarly, do local authorities realise that to meet demand greater than that provided by the first cabinet, the streets will have to be cluttered with more cabinets? Besides, who will pay for the extra cabinets post 2015? In addition, technology advances such as G.fast and vectoring, which have still to be proven in the field, are dead ends because of the copper in the last mile. BBC Newsnight and others reported last August that FTTC was the wrong technology in the opinion of experts, here and here. The local authorities’ lists of postcodes that BT will cover disregard the known line performance and lengths. BT knows the limitations of the service speeds and provides that data as soon as a cabinet is forecast for service. For example, in Peaslake, Surrey BT told the Surrey County Council it will cover the postcode GU6 7NT; yet superfast broadband is unavailable at all 10 addresses, according to the BT Wholesale estimator. BT is very good at promising the world, but once a customer is hooked for its VDSL service there can be a distinct change of attitude. The subcontractors that BT Openreach hires for installations simply don’t carry the test equipment that can confirm the line’s performance. They rely on a speed test which, just after installation, is tuned to the maximum possible speed. This can change in just 48 hours. At one site we know of, a sync speed of 40Mbps on 9 July degenerated to only 4.38 Mbps by 08:09 on 11 July. Subscribers then risk a charge around £170 to fix the wires if a fault is detected within their curtilage* (the area around your premises over which you are deemed legally to have control). A number of ISPs are now offering self-install packages but the result is likely to be more disgruntled customers. How many end users have a detailed understanding of house wiring, let alone line performance issues? Surely Trading Standards should insist on a proper performance test once the connection has had time to “bed down”? The difference it makes can be material. One case we know of concerns a new Sky self-install where the installation produced 13 Mbps. After remedial works to the house wiring the speed jumped to 28Mbps. That is still well below the “up to” 42Mbps the user was led to expect. The separation of powers between Openreach and its wholesalers means that when a fault occurs, the end user has to convince the ISP, and the ISP has to convince Openreach to fix it. This thread on the Kitz bulletin board (two pages) shows just how hard it can be to figure out and fix what’s wrong. It shows clearly that faults on the copper (telephony) network can destroy broadband performance, and that Openreach’s process and practice to fix them is arcane and open to error, to say the least. Those responsible for making policy and for paying BT might also like to ask how BT can invest a billion pounds on TV sports contracts while Openreach’s maintenance performance has been so bad for so long that it has accepted it must pay fines if it misses certain targets. Even casual observers can see signs of poor maintenance. 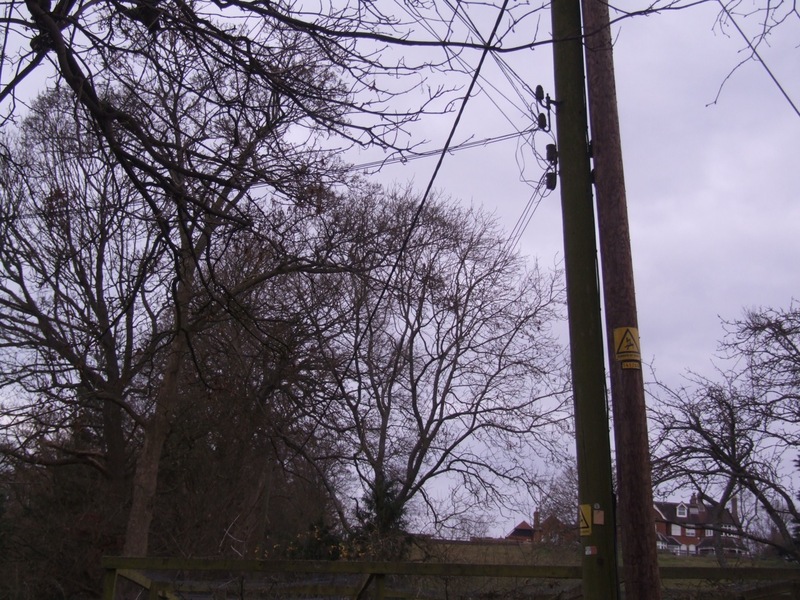 For example electricity poles are quite properly being replaced, but the old rotting and unsightly poles remain lashed to the new ones, apparently because Openreach can’t afford to swap the cables from the old poles to the new ones. These may be boring technical details, but in the end, they determine the customer experience. BT may be able to buy off shareholders with dividends and politicians with promises, but only performance will win the hearts and minds of customers. As BT is the monopoly supplier in most rural areas, unhappy customers have only the ballot box through which to voice their displeasure. With elections just 18 months away, anyone whose job depends on a vote should start getting their hands dirty with the technical details of superfast broadband.